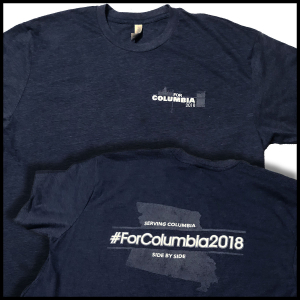 One of the ways ForColumbia strives to love and serve our neighbors is by serving those non-profit organizations who are actively working every day in the lives of people in Columbia. As we get out to talk to people, one of the things we’ve learned is that it is often difficult for non-profits to find the time needed to clean their vehicles thoroughly. These organizations use their vans and SUVs to transport children and other individuals; focusing on effectively serving people, they often don’t have time to focus on keeping their vehicles clean. One way we can support non-profits in our city is by spending our time serving them in ways they don’t have time to do themselves. And who doesn’t love a nice, clean vehicle to drive? ForColumbia volunteers will work outside at Calvary Baptist Church, washing non-profit cars at no cost, and offering to wash cars for the general public as well for a donation of an unopened package of diapers (or a $10 minimum cash donation); this donation will be distributed between multiple non-profits here in town. If you have buckets, sponges and/or a shop vac you can bring to use as you serve, that would be great! Volunteers should come prepared to work outside; if sunny, we encourage you to bring sunscreen and/or a hat. You will most likely get wet at this serving site, so dress appropriately but modestly for this project; no bathing suits, please. The Site Leader assigned to this project has final say in determining appropriate clothing decisions. Yes, elementary-aged children who can assist in this project are welcome to participate.